Elixir Door and Metals Company continues to offer customers with door hardware that is practical and affordable. With a wide variety of entry door products that are used in a multitude of applications including manufactured housing, modular housing, concession stands, utility buildings and cargo trailers, we needed a complete line of door hardware that fits every application our products are utilized. 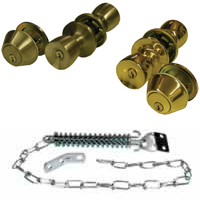 Door locks, door chains, storm door closure kits, hinges, thresholds, drip caps, knocker-viewers, kick plates and striker plates are samples of door hardware we can provide. Each lock is packed with a universal latch, plastic gasket, installation instructions and a zinc die cast striker. Please contact your local Elixir Sales Representative today! In order to meet the ADA standards, Elixir has designed a new threshold. The design integrates an interior ramp and an exterior ramp with the threshold to ensure that the threshold is ADA compliant. These two ramps are easy to install and are specifically designed to go with the threshold/bottom of door frame. The door itself was also modified at the base to maximize the quality of this new design. The typical lip of the door was replaced with a flat bottom that utilizes a specially designed sweep. Made specifically for the threshold, this sweep excels at keeping the elements out of the building. It was also designed to propel water away from the base of the door.